In my quest to complete the Major Numbers of my USA collection (at “least” from 1930 through 2010), I have, as you can imagine, quite a few holes. Filling these holes is sometimes a challenge, so I have decided that, when possible, fill the hole with something interesting. This brings us to the Admiral Byrd Antarctic Issue (Scott #733). Originally, this stamp was issued in 1933 for the Second Antarctic Expedition. People could purchase this stamp and with an additional 50c surcharge, have their cover cancelled in “Little America” Antarctica. James A. Farley, Postmaster General of the United States, went on to issue 2 more versions of this stamp. The first, an imperf sheet of 6 for the 1934 National Stamp Exposition (Scott #735), and the 2nd, part of the Farley “Special Printings” in 1935, sheets of 200 (Scott #753). My Collection was missing all examples, so I went on a hunt and filled the hole for the 1934 imperf sheet with this, pretty cool, first day cover. My Attraction to this cover was, hopefully, obvious. And in keeping with my “Fill the holes with something interesting” rule. This fit perfectly. This cover was sent from New York to Chicago, via Airmail, and Registered. I can’t seem to find information on Registered postal rates in 1934, however, the airmail rate at the time would have been, I believe, 6c. So I am not sure how this cover came to be? 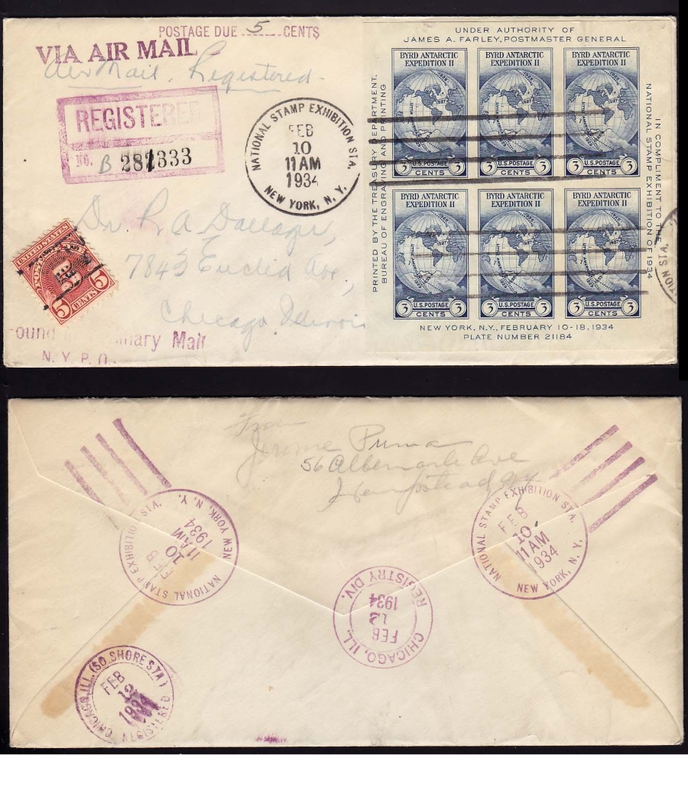 It is franked with 18c worth of postage BUT, it was marked with 5 cents postage due, meaning that the Registered Airmail Rate of 1935 would have been 23 cents? The Airmail Rate was 8c and the Registered Mail Rate was 15 cents which adds up to this being 5c short. These sheets actually had 2 “First Day Of Issue” cancellations. Feb 10th in New York, and Feb 19th in Washington DC.